When Jesus offered Himself up as a sacrifice for our sins, He didn’t present a hollow offering. It was pure and solid, His own blood the propitiation for our sins. Wearing a gold crucifix honors His atonement, and when the pendant is solid gold all the way through, it means even more. This is our best-selling crucifix, and rightly so. No one else offers a solid tube instead of a hollow one! The crucifix pendant is suitable for both men and women and the cross by itself measures approx. 1 1/2″ tall x 7/8″ wide. With the hoop/bale, the crucifix pendant overall height is approx. 1 13/16″ tall. You, our customers, asked for a weightier and more substantial pendant, and we responded. This fine quality jewelry pendant will last for generations to come! If you don’t have a special chain to wear it on, choose from one of our gold chain pendants in either 18″ or 10″ length. Even the chains are solid gold! Apples of Gold Jewelry® offers this original design in 14k, 18k, or 22k solid gold, or select white gold or sterling silver as you prefer. See our collection of Gold Crucifix Pendants for more inspiration! If you seek your identity in God, this beautiful, plain tube cross is a wonderful way to show that. To someone who has given his life to the Lord, he has gained the whole world and saved his soul! 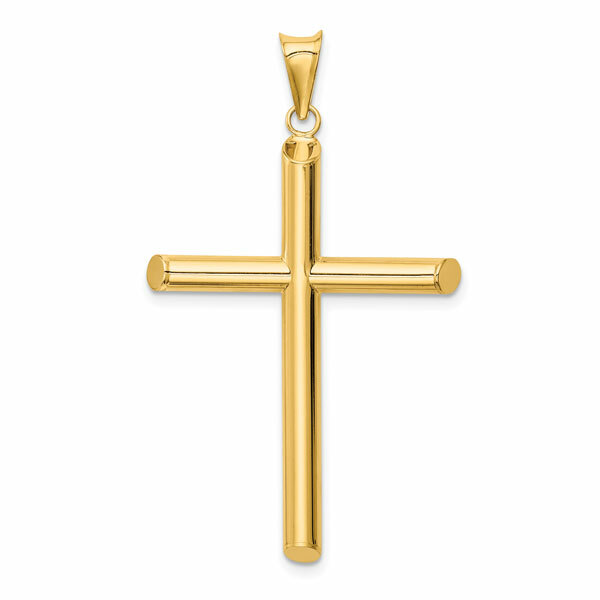 The 14K yellow gold pendant is a simple tube design, with a polished finish that makes up the entire body of the cross. The cross, which measures just over 1 9/16″ tall (or just over 1 3/4″ tall with the hoop and bale included), by 1 1/8″ in width. The ends of the cross have an angled, circular design, matching the tube formation of the cross. For the man you love, this would make the perfect Valentine’s Day gift. See the rest of our marvelous collection of Plain Cross Pendants to find one that perfectly fits your man! 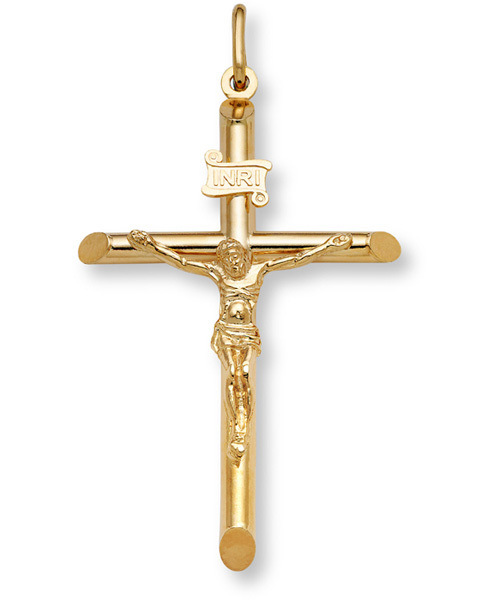 While we have many Yellow Gold Crucifix Pendants, this is one of our favorites. It has a lovely shape in the tubular cross and the figure of the Savior is rendered in minute detail. The new man (or woman) has died to the old self and been raised a new creation when Christ became the life-giving atonement for the sins of each one of us. Now is the perfect time to give your true love the emblem of the true Lover. Valentine’s Day is coming up shortly, so why not give a gift that will be handed down for generations to come? Made in fine-quality 14k yellow gold. Cross measures 1 1/2″ tall x 7/8″ across (1 3/4″ tall with hoop). We always guarantee your satisfaction or we’ll cheerfully exchange the item or refund your money, no questions ask. Free shipping, too, in the USA and international shipping is also available.